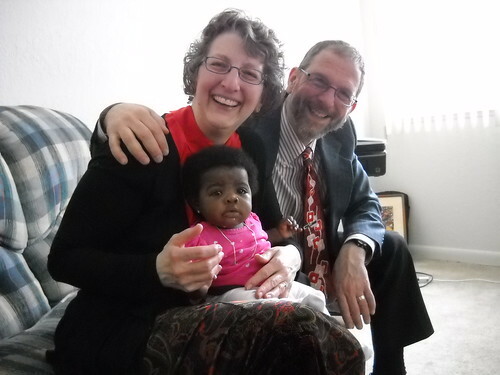 This weekend, my parents were honored to become godparents again. This time, to the lovely little daughter of a woman from our church. Dad is the naturally talkative sort, and he always welcomes new people to church. This particular young woman attends the same university as I do, but is studying in the nursing program. She came from Ghana with her brother to study here several years ago. A few weeks ago, she asked my parents to be godparents to her little Audrey. You can't quite see in the photo, but little Audrey is wearing a necklace and ring made by her uncle in Ghana with her initials on it. Definitely one of the most beautiful gifts to be given to a little one. My parents and I spent part of Sunday afternoon (after the Baptism Mass) celebrating with Audrey and her family, and it is lovely how the Church brings such a variety of people into the same place. That is an honor for your parents! What an adorable little girl!!!! Such a lovely picture.